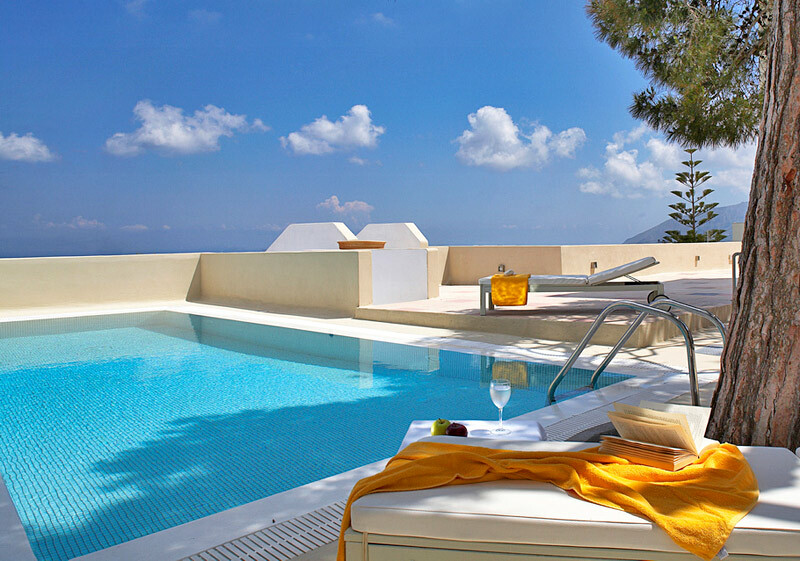 Aria Lito Mansion is located in the beautiful old quarter of the capital city of Santorini, Fira. Aria-Lito is an architectural wonder and having been the location of distinguished guests, it is known now for the excellent service and the luxurious accomodations. Aria Lito Hotel offers wonderful views to the Eastern side of the island and in the distance all the guests can whatch the deep blue sea of the Aegean. If you are looking for refined luxury wrapped in a peaceful atmosphere right in the middle of Fira, Aria Lito is surely the place to be! The Mansion is easy to be accessed via air and boat transportation and it is only 8 kilometers away from the airport and the port of Athinios. Double Room: Magnificently built into the rock following the unique architectural style of Santorini, the Aria Lito Double Rooms are fitted with a comfortable double bed and a cozy sitting area and incorporate a capacious marble-tiled bathroom with a shower cabin.The large wooden doors open onto the sunny terrace on the ground floor featuring a Mediterranean style breakfast table with chairs.Bedroom, veranda, bathrooms with bathtub. Superior Double Room: The gracefully designed Superior Double Rooms feature one bedroom furnished with a queen size bed, a spacious marble-tiled bathroom with bathtub, and a shared sun kissed terrace overlooking the hotel’s fragrant garden. On the room’s terrace, one can find a Mediterranean style breakfast table with chairs, from where to enjoy a distant sea view to the East. Suite: Aria Lito Suites comprise of a spacious bedroom with one queen size bed or two twin beds, a tastefully adorned dining area with a comfortable sofa bed and a stylish marble-tiled bathroom with bathtub.All suites boast a shared sun kissed terrace with a Mediterranean style breakfast table and offer distant views to the shimmering Aegean Sea and the eastern side of the charming town of Fira. Queen Suite: The majestic yet comfortable Queen Suite features an impressive ceiling fresco, beautifully adorned wooden furniture and handpicked works of fine art. The spacious bedroom is fitted with a queen size bed with luxury bedding and furnishings, as well as an elegantly designed sitting area. The Queen Suite also comprises of a separate elegantly decorated sitting room with a comfortable sofa bed, a capacious marble-tiled bathroom with bathtub and a shared sun kissed terrace with a Mediterranean style breakfast table with chairs and distant sea view to the East. Aria Lito was built around 1900s in a traditional aegean style. It is now totally rennovated and turned into a luxurious and modern hotel. Aria-Lito Mansion offers many facilities, such as a swimming pool, romm and maid service, a wine cellar with a selection of Santorinian greek but also International wines and many more.